Autumn is upon us (although we keep regressing back to Summer in Philadelphia). Time to try something new! I sold my beloved kiln and controller that I used for bead annealing, fusing glass and, most recently, metal clay. I want to upgrade to a kiln that can handle cone 6 firing so I can work with porcelain on a regular basis. Here are some new baubles I’m currently working on. Cone 6 white porcelain and Mason stains, unglazed. I wrote a review of Prometheus Clay while back. This time I tried Five Star Bronze Clay which is also torch fireable. And I can say that Prometheus clay wins hands down, at least for torch firing. I find Prometheus easier to condition, easier to work with and I got more consistent results with the torch. I have not tried kiln firing with 5 Star Bronze yet. I’ll let you know the results when I do. But the BIG story is that I am now making my own bronze clay. I saw Alan Wiggens’ YouTube videos on the subject and decided to give it a try. I read about metallurgy to get an understanding of the sintering process so I could find the best deal on a powdered bronze that would work. Preliminary torch fire tests have been successful! Not in making a finished product, but in making metal that I can pound out with a hammer. I am eager to test my homemade clay in a kiln which is how Alan Wiggens recommends firing it. Stay tuned. Bronze clay ready for my future kiln. The lighter clay is my homemade clay. The darker clay is Five Star Bronze. My mother made bread every week when I was growing up so the process is no mystery to me. 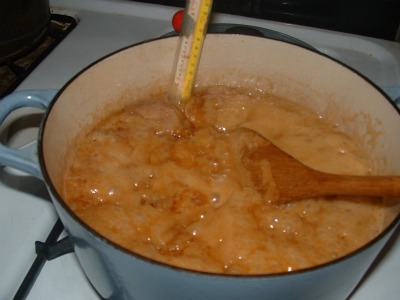 I generally throw flour into a bowl, add yeast and some honey and sugar to feed the yeast and park it under the kitchen tap and turn on the water. No measuring, no recipe. And no salt. I have a friend who says that the flour and bread we buy in the United States is stale and a bit moldy and that is the reason most (not all) people have a problem with gluten. (I have another friend who gets sick every time she eats pasta in the U.S. but can eat all the bread an pasta she wants when she goes to Italy). So I decided to grind my own flour. I got a grinding mill and 40 lbs of wheat berries. Grinding your own flour is not cheaper than buying it, although there are wheat berry bargains to be had. And the process is labor intensive. First, you have to drag the 40 lb bucket into the house. Then you have an argument with your husband about where to set up the mill. Then you and your husband have to watch an [expletive deleted] video to figure out how to get the [expletive deleted] lid off of the [expletive deleted] bucket of [expletive deleted] wheat berries. Next comes the grinding. After hand cranking the wheat berries, we learned why we refer to arduous tasks as a “grind.” (Or maybe he knew already. He has a Ph.D. in English Literature). Here is the flour. What you don’t see is all the[expletive deleted] flour around my kitchen. Nothing says lovin’ like something from the oven,. Well, almost nothing. And in the spirit of trying something new, let me introduce you to our new motor for the grain mill. It makes a sound like squealing pigs on steroids, but it does the job. And the towel is to keep down the flour dust. Now, on to trying the autolyze process. On a final note, even Boris is trying something new. He is off the Prescription Diet and is now eating a new, almost as expensive Hills Science cat food. And he likes it! I have always loved the idea of Petit Fours: little multi-layer cakes that look like miniature iced gift boxes just waiting to reveal the secret of their delicious insides to whoever is lucky enough to bite into them. Sensible people buy their Petit Fours but how many times have I told you that I am not a sensible person? 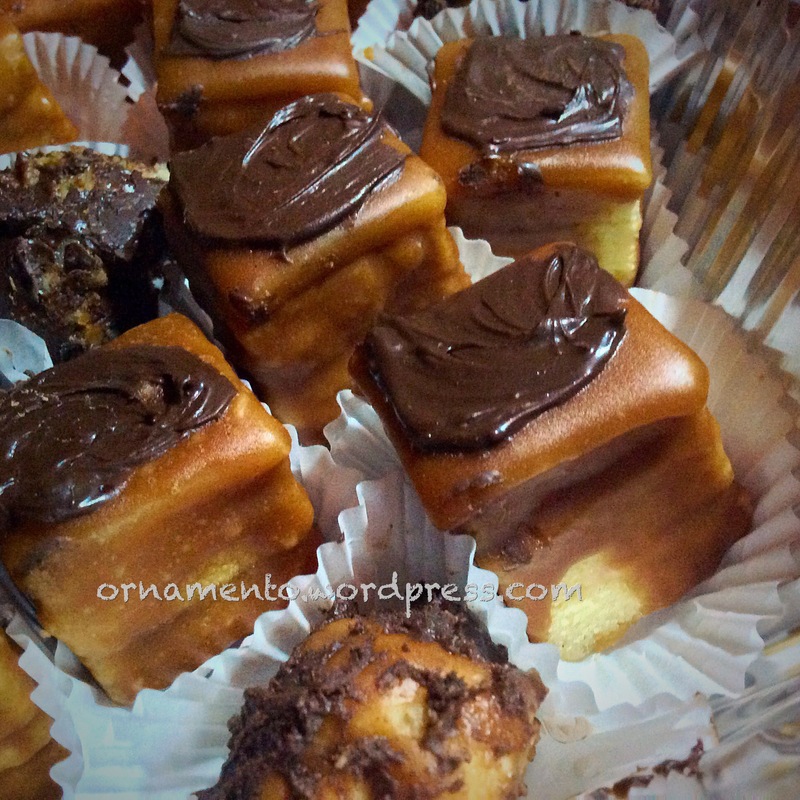 I have been on a periodic Petit Four odyssey since high school when I would experiment in my mother’s kitchen. I had a willing and perennially hungry friend who would eat the rejects. I even tried my hand at making fondant, unsuccessfully I might add because I did not have a candy thermometer which my mother regarded as a mysterious scientific instrument not meant for everyday cooks. Still I had fun and my results were tasty even if they looked like the cat walked over them. I mean, butter, sugar and eggs? How can you go wrong? It’s like shooting Petit Fours in a barrel. This time around, I got the bright idea that I was going to turn a recipe for Sicilian Cassata into Petit Fours. I should have known that there was a good reason I could not find a recipe for them on the Internet. I decided to develop my own. 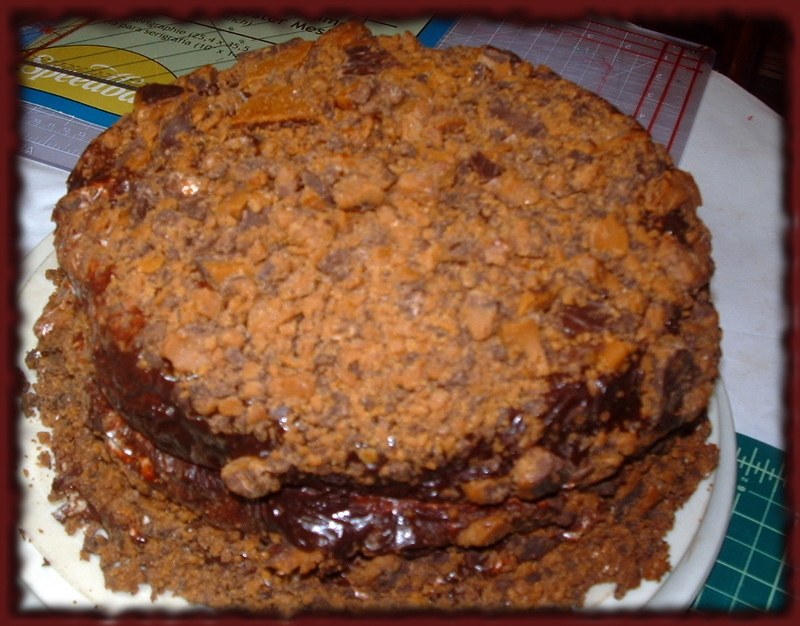 I started with one of the best recipes in the world: Sponge Cake courtesy of The Cake Boss. Believe me, the secret to making this case is beating the eggs as instructed in the recipe. See the top picture of the thick and lovely batter? That’s after beating the eggs! I made the cake in a big cookie tray (16 X 24) lines with parchment. It baked up nicely. 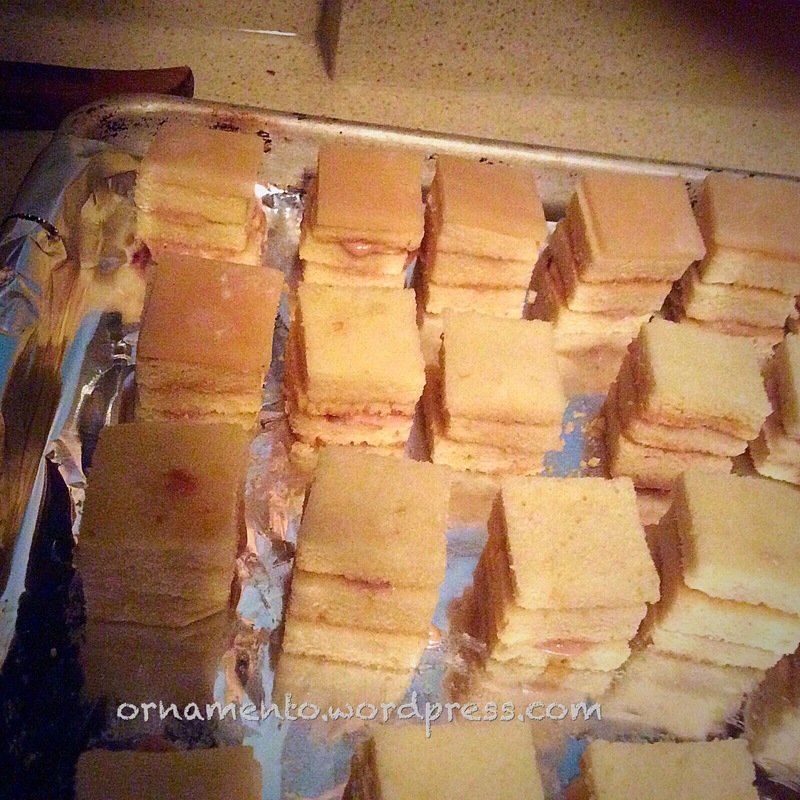 Now most Petit Four recipes tell you to slice the cake into layers, ice and fill the layers, and then to slice the whole thing into little squares. Not me. I cannot slice anything straight. You can hide wopperjawed layers, but not uneven cake sides. 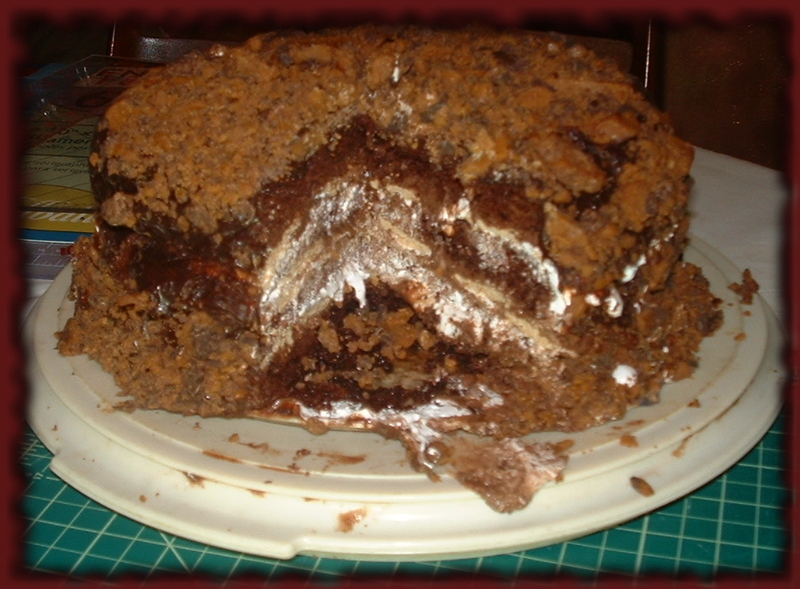 So after I layered the cake (tip: cut the cake into small sections and cut into layers a section at a time. Easier than trying to slice a big cake into layers. And use a serrated knife.) 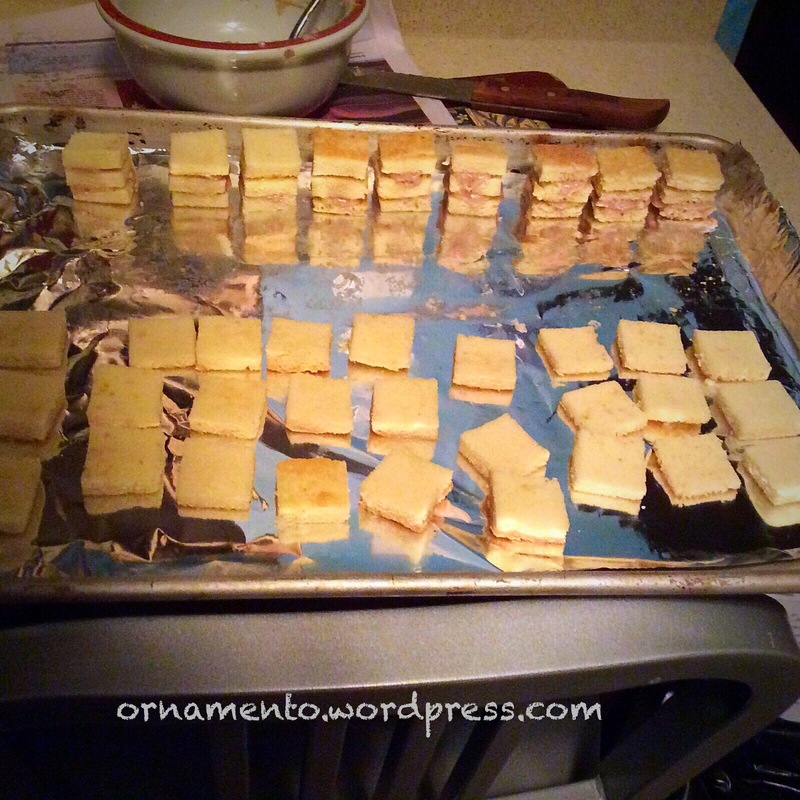 I cut out little squares and stacked them with ricotta filling in between. Only it is impossible to make a ricotta filling for cakes this small because it does not hold its shape. So the filling was ricotta with LOTS of powered sugar. It was good, but not the same as Cassata filling. I bought almond paste which I have never worked with and I had planned to use it between layers but I decided to top the cakes with squares of it instead. Here are the naked cakes before glazing. The balls are made of the scraps mixed with the filling. I thought I could make some kind of truffle from these. Glazing. Thank you 350 Degree Oven Blog for the broken fork trick! And this is the best I have ever done making Petit Fours, which means there is still time to screw it up!! I was going to cover them with chocolate confectioner’s coating, but for the life of me I could not get it into a pourable state. So I ended up topping each cake with a smidge of chocolate. 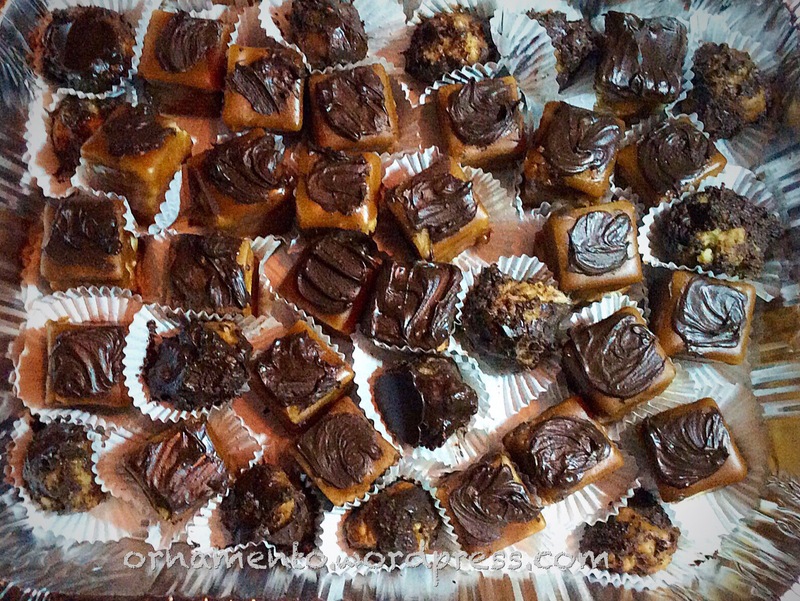 I attempted to coat the “truffles” and they came out rather <ahem> rustic looking. 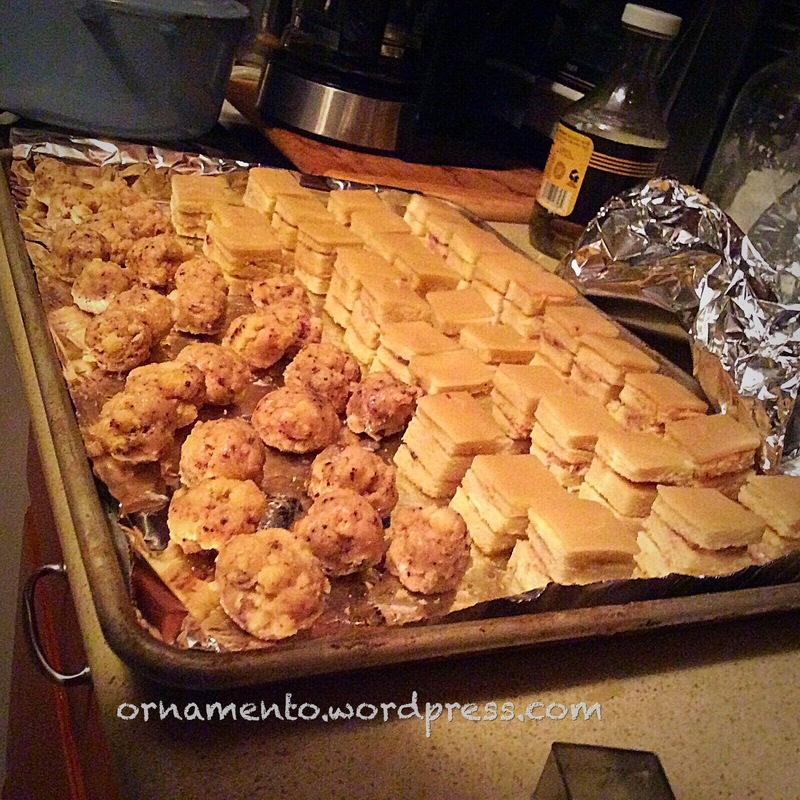 The Petit Fours were a hit at the party I took them to, but I have to confess that I skipped them in favor of the shrimp! I didn’t have an Easy Bake Oven when I was little. I didn’t need one. My mother let me use the big oven, with her supervision of course, but I was turning out cakes and cookies by the time I was six. I remember when I was in Kindergarten, my friend Debbie Levine asked me to come over to her house for lunch. I came and brought some peanut butter cookies for dessert-you know, the lunch box classic with the crossed fork marks on the top. “I baked them myself,” I announced proudly. Debbie must not have been too impressed because she took a bite out of one and screwed up her face. “Eewww,” she said, “they taste like throw up.” Debbie’s mother rushed over and took the cookie from her hand and said, “Debbie we don’t treat our guests like that.” I wasn’t too upset because I knew Debbie was only kidding. She finished the first cookie and had a second one. My mother made spritz every Christmas and had an ongoing battle with her constantly malfunctioning cookie gun. She wouldn’t get a new one though; she preferred thrill of the hunt for the perfect recipe for spritz dough that would work in her cookie gun. She never found it and when she died, I returned her cookie gun to the earth. I was never fond of spritz anyway. If you make cookies that have to be cut out and decorated, do yourself a favor and make them over the course of three days. Mix your dough on the first day and let it chill properly. Just put it in the fridge and forget it. Roll, cut out and bake on the second day. Decorate on the third day. This will make your life so much easier. If you think this is impractical, go out and buy some cookies. Properly chilled dough is easier to roll. Rather than dusting with flour during the rolling, I prefer to use cooking spray. I spray the rolling surface, my hands, even the rolling pin. If you roll between sheets of wax paper, spray the paper. If after you’ve cut the shapes out the dough is soft again, return the wax paper with the cookies to the fridge for a couple of minutes to let it firm up. You will be able to move the raw cookies to the pan without distorting them. It’s important that rolled cookies have a consistent thickness. I have a rolling pin that has different sized rings that fit on the ends to help maintain uniformity. You can get yourself a set of rings here. If you learn only one thing from this post, let it be these two words: parchment paper. 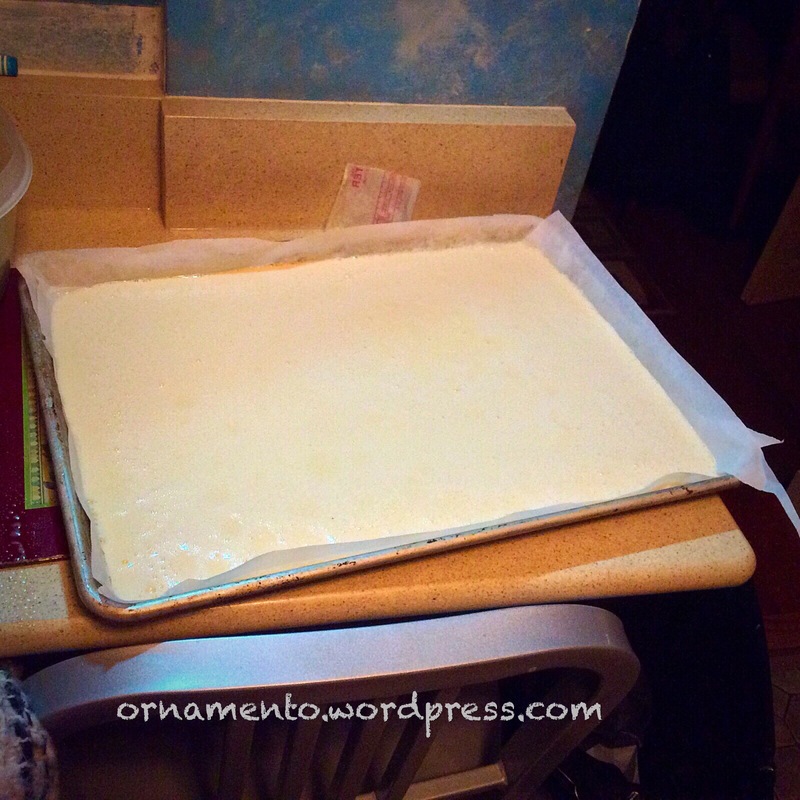 Parchment paper for baking that is. I don’t know what took me so long to start using this stuff but once you use it, you won’t go back. It saves on pan cleanup and you don’t have to grease your cookie sheets. It’s easy transfer a whole batch of baked cookies off the hot pan for cooling and it’s easy to get them off the paper. Foil or a so-called non-stick pan will not give the same results. I do not advocate any particular brand. I bought mine at a grocery store. I have heard that you can’t use sheet more than once. Not true although it does become brittle after awhile and since you can’t really clean it, you don’t want to save it too long. I love the convenience of refrigerator cookies and who says you can’t slice and bake drop cookies like chocolate chip or oatmeal cookies? It’s easy. I make logs of cookie dough, wrap it in foil and put it in the freezer. It never freezes rock solid. A day or two later, I unwrap the dough, slice and bake. What could be easier? These cookies keep a shape too. But with any cookie, always make sure you start out with a cold cookie sheet. Otherwise your cookies will spread more and you won’t get the shape you want. I have two cookie sheets and bake with one sheet at a time. When a batch of cookies comes out of the oven, I wait a couple of minutes and lift the sheet of parchment with the baked cookies (carefully!) off the pan and put it on a rack or other surface to cool. Then I let the pan cool before putting the next batch on it. If there is a short time between batches, I will cool the pan in the sink with cold water. It really does make a difference. Well, tomorrow night is decorating time! Here are some more pictures of today’s cookies. William Blake’s Favorite Chocolate Death Dessert? Baking, Chocolate, DessertsBaking, Chocolate, Chocolate Death DessertLeave a Comment on William Blake’s Favorite Chocolate Death Dessert? I think William Blake nailed it when he wrote “The road of excess leads to the palace of wisdom… You never know what is enough unless you know what is more than enough.” Blake was the sort of man who would have liked Maxwell’s Hockey Puck Birthday Cake. It’s the kind of dessert you eat on the road of excess and you will definitely know when you have eaten too much. I can see Blake now, sharing it with Mrs. Blake on those occasions when they relaxed naked in their back yard after a hard day of poetry writing and print pressing. But I digress. I decided to create a new dessert for my stepson Maxwell’s fifteenth birthday. As a wicked stepmother, I firmly believed that Maxwell was in serious need of wisdom. His father and I didn’t know any ancient wisdom initiation rituals. (You can’t find a decent mountain or eagle feather in Philadelphia anyway.) We had already done the therapist thing but that only meant that the hapless lad would suffer from our mistakes instead of our parents’ mistakes. Besides, the only really useful tip my mother ever gave me was never to slap a man who chews tobacco. (I think Max already knew that.) I was going to write that this is the point where I thought of William Blake, the road of excess, and the Hockey Puck cake. I sadly admit it’s not true. I merely decided to indulge Maxwell’s voracious sweet tooth with a dessert that combined several of his favorite desserts into one. 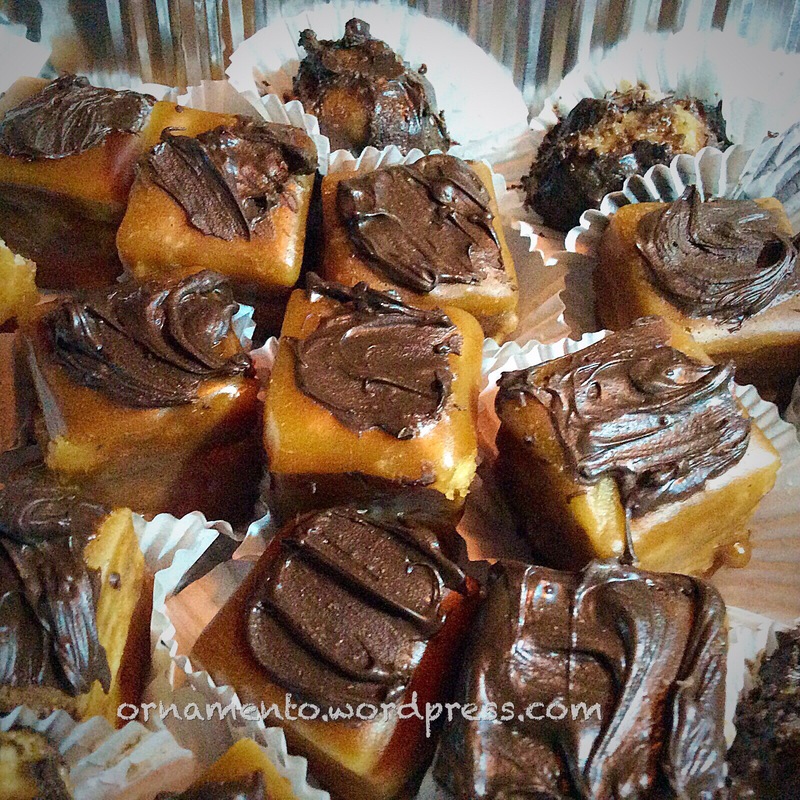 Let’s see-there was his mother’s brownies (high on my list too), his grandmother’s Jello cake, (technically stained glass cake) for the graham cracker crust. (Jello is a poor excuse for a dessert.) Max loved chocolate in its many forms including fudge and toffee (but no nuts because Max didn’t like them. ) I included marshmallow crème for something white. My mother shrieked when I told her my plan, “You’re gonna give that boy sugar diabeetees!” “I hope not,” I worried. At least not until he’s on his own medical insurance. 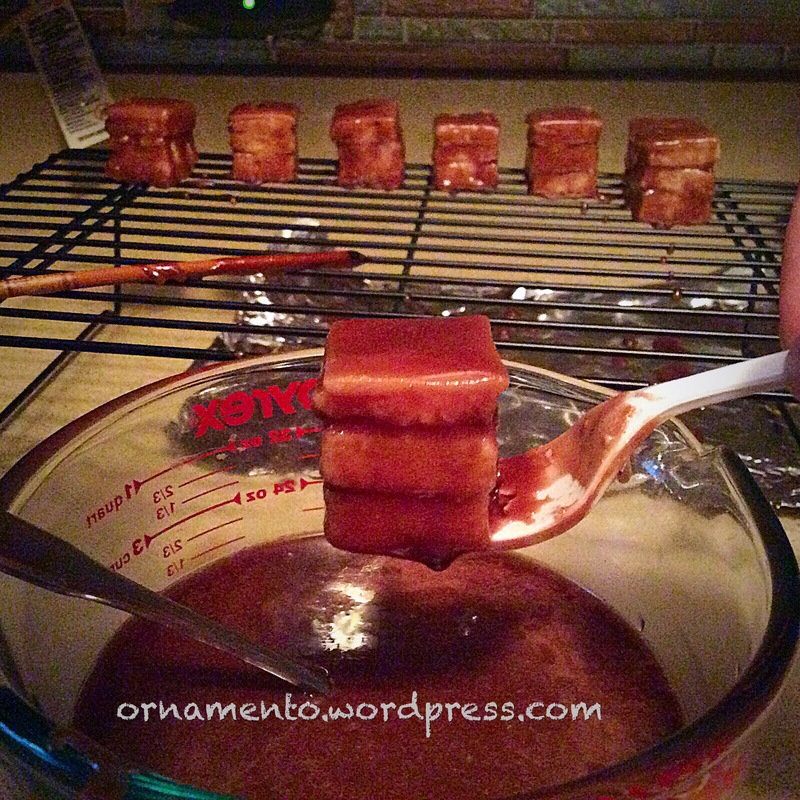 I made the first Hockey Puck (recipe follows) cake and my husband and I each had a sliver. Maxwell and a friend each downed two large wedges after scarfing down spaghetti and meatballs. (Which they washed down with Jolt Cola laced with saccharin.) My husband and I laid prostrate on the sofa helpless to stop them, listening to our hearts beat like jack hammers. We did achieve a measure of wisdom that night. The teenage boys? Not so much. 20+ years later, I am happy to say that Max has apparently learned restraint because he does not have diabetes. Which is good for him because he has two little boys and children try to travel the road of excess as often as it takes to make their parents crazy. And why is the cake called Hockey Puck? 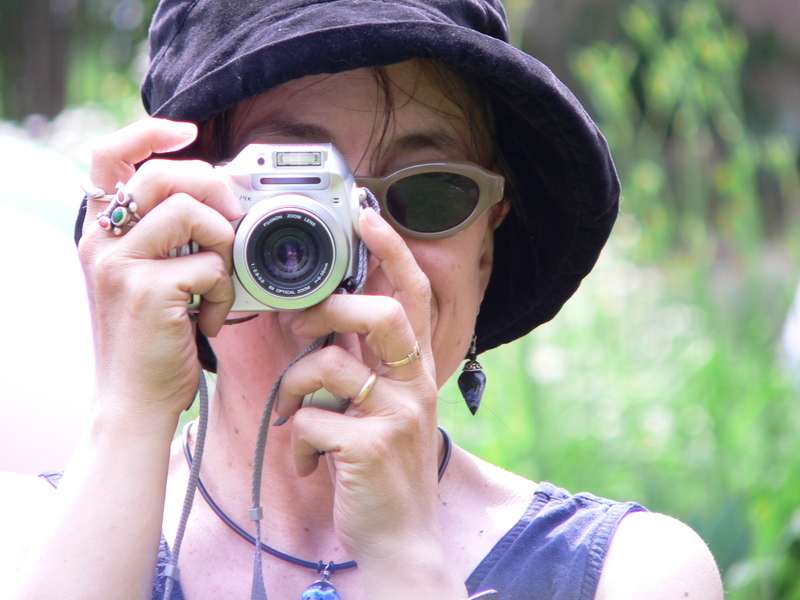 When I first made it, my husband took one look and remarked that it looked like a hockey puck with a thyroid condition. Combine ingredients in a saucepan and heat slowly until it starts to boil. Boil mixture for one minute and remove from stove. 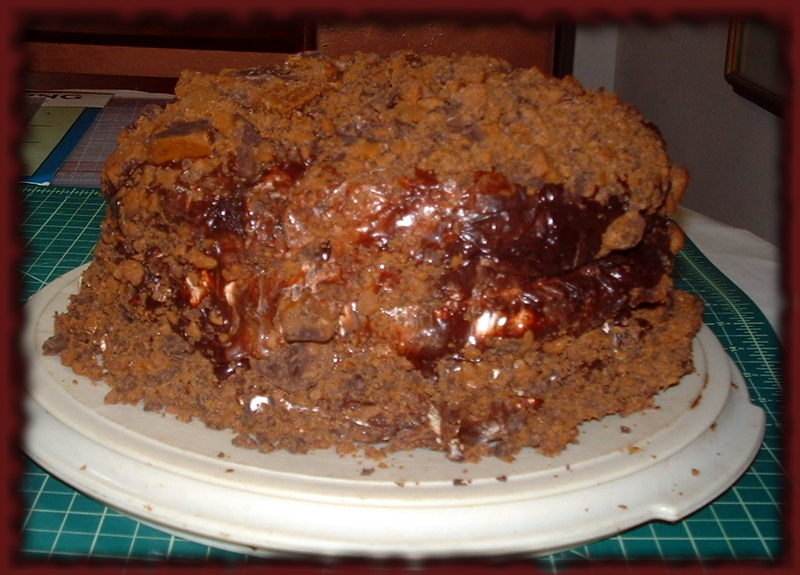 Let it cool for about 5 minutes before pouring it over the cake. If it hardens, heat in microwave. 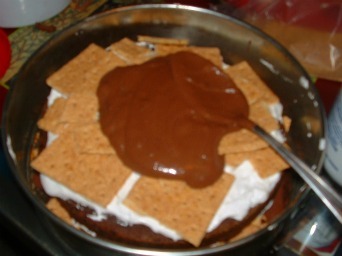 Spread with one third cup of the marshmallow crème, cover with graham crackers breaking them to fit. Cover this with one third of the chocolate ganache. Place on the next layer c ut side down and repeat with the remaining layers and filling ingredients. You can use less of the filling if you wish. 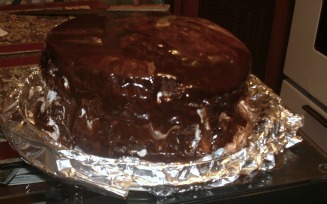 Cover the top of the cake with foil or plastic wrap and put it in the refrigerator for 2 or 3 hours. Use the freezer if you are in a hurry. 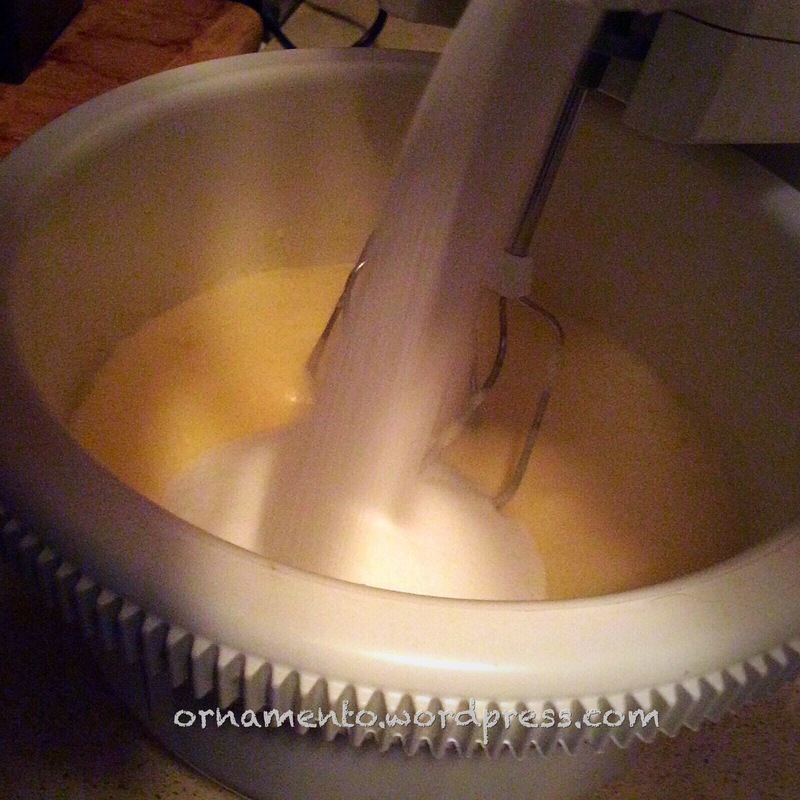 After removing the cake from the freezer, remove the sides of the spring form pan and place the cake on a serving dish. 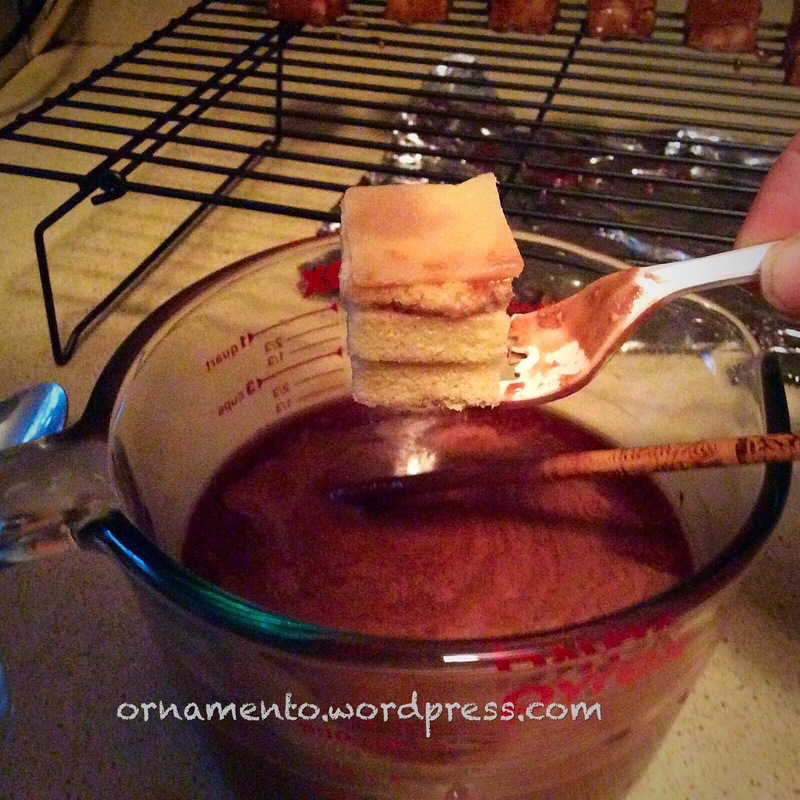 You can surround the cake with strips of waxed paper to keep things neat. 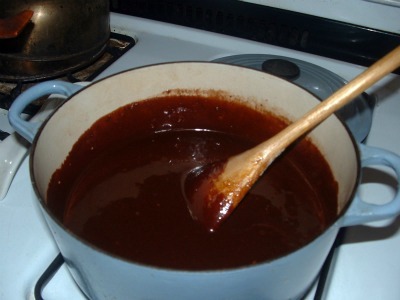 The next step is to pour the fudge sauce over the top of the cake, covering it and letting it run down the sides, spreading it to fill in as best you can. It won’t look real neat, but that is the nature of the Hockey Puck. Crumble the toffee and sprinkle liberally on the top of the cake. Press into the sides. Cover the cake loosely and refrigerate. If you have used strips of waxed paper on the plate, remove them before serving. Eat slowly, savor and enjoy! Plumpton reviewing the recipe before I kicked him out of the kitchen.